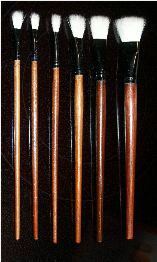 An ultra-soft set consisting of 6 medium handle blender brushes. This is a unique brush set used for blending oil colors after using zigzag strokes against multiple colors. This is a specialty set designed specifically for color blending. However, landscape painters will enjoy using these brushes with thinned color to paint tree and ground foliage.